...Arik Braude played with a radiant timbre, constantly engaging...seldom does one hear Mozart's Kegelstalt Trio played so beautifully. ...With a thoroughly infectious joy in playing, Arik Braude put virtuosity and sensitivity at the service of this very beautiful work [Mozart violin & piano sonata], getting the concert off to the finest possible start. ...powerful and expressive performance, with phrasing that demanded the audiences' attention. Praised for "sophisticated, warm intensity, radiant timbre and well-balanced, harmonious performance style in the best chamber music tradition," (Sulzbach-Rosenberg, Germany), violinist Arik Braude performs regularly in concert series and festivals on both sides of the Atlantic. As a soloist he has appeared with the Bangkok Symphony Orchestra, the Israeli Sinfonietta, the Belgorod Symphony Orchestra (Russia), the Antwerp Chamber Orchestra (Belgium), and numerous festival orchestras, including the International Master Players (Switzerland), the Yehudi Menuhin Festival Orchestra (Switzerland), and most recently, the Minsk Orchestra of Belo Russia (Fetes musicales de Savoie, France). Chamber music festival appearances include Music@Menlo (CA), Festival des Arcs (France), Fetes musicales de Savoie (France), Sulzbach-Rosenberg International Music Festival (Germany), Musicales Internationales (France), and the Killington Chamber Music Festival (VT). He has recorded for Music@Menlo, Talent Cassics and Le Chant de Linos labels. Mr. Braude was featured in the February 2010 issue of the Strad Magazine, in an interview about his teaching. Along with his wife Sophie Arbuckle, and in collaboration with French harpsichordist, Georges Kiss, Mr. Braude founded Jeunes Virtuoses de New York in 2008. He also teaches at the Aaron Copland Conservatory of Music at Queens College (CUNY) and the Mannes College of Music preparatory division. He is a member of the artist-faculty of the Green Mountain Chamber Music Festival in Vermont. He has directed the Young Artist program at the Music@Menlo festival (CA), has served as guest violin professor at the Festival des Arcs (France), and has been a member of the artist-faculty of the Killington music festival (VT) and the Interharmony Music Festival (Germany). He has given master classes in France, Germany, England and in the US. Mr. Braude’s students have appeared as soloists with the New York Philharmonic and other orchrstras in the US, France and Germany. They have been given opportunities to collaborate with some of the leading chamber musicians in New York City. They have won numerous competitions, including From the Top and the LISMA International Music Competition. Mr. Braude’s students have successfully served as concertmasters of most of the major youth orchestras in New York, including the New York Youth Symphony, and have soloed with most of them. Mr. Braude began his violin studies in a special music school in Kazan (Russia) with his father Nathan V. Braude, a student of the legendary Abram Yampolsky. He continued his studies in Israel with David Oistrach's assistant, Piotr Bondorenko, and Felix Andrievsky, and later in Hanover (Germany) with Jens Ellermann, in London with Ifrah Neeman, and in New York with Sally Thomas. He has performed in master classes for Isaac Stern and Alexander Schneider at the Jerusalem Music Center (Israel), and Ruggiero Ricci at the Yehudi Menuhin International Music Festival in Gstaad (Switzerland). ...flamboyantly responsive, flexible and supple viola playing. Marie Louise Scharf Sulzbach-Rosenberg, Germany"
Sophie Arbuckle currently serves on the faculty of the Juilliard School Pre-college and the Mannes College of Music Preparatory Division. She has performed extensively throughout the United States, Canada and Europe. She has appeared in several chamber music festivals, including Music@Menlo (California), where she co-directed the 2004 chamber music workshop, the Killington Music Festival (VT), Patrimoine en Musique des pays de l'Ain (France), Fetes Musicales de Savoie (France), Interharmony International Chamber Music Festival (Germany), and Green Mountain Chamber Music Festival where she has been a member of the artist-faculty since 2006. She has served as guest concertmaster of the Sudbury Symphony (Canada), with whom she performed frequently as a soloist. Recent solo appearances include Mozart Simphonie Concertante with the Belgorade Orchestra (France). As the violist of the Braude Ensemble, Ms. Arbuckle has performed in many prestigious venues such as the Royal Flemish Philarmonie Chamber Music Series (Antwerp), Philarmonique de Namur (Theatre Royal, Ghent), Series Pont Rouge (Ghent), Astoria Concerts (Brussels), Festival des Arcs (France) where the ensemble was in residence in the summer 2004, Fetes Musicales de Savoie (France), Musique sans frontieres (France), and Musicales Internationales (France). Ms. Arbuckle has been closely affiliated with her husband, violinist Arik Braude, teaching a large and vibrant studio of young musicians. In 2007, they were invited to bring selected students for professional engagements as a part of the “Fetes musicales de Savoie” in France. 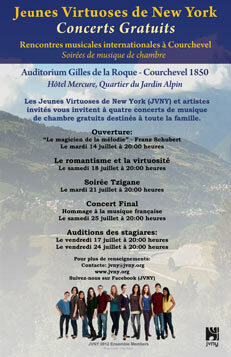 The success of the concerts led to the establishment of the “Jeunes Virtuoses de New York” master course and concert series. Ms. Arbuckle holds an MM degree from the Juilliard School. Nathan’s festival appearances include “Progretto Martha Argerich” in Lugano, “Ravinia Festival” inChicago, ‘’Festival de RadioFrance” inMontpellier’’ and the “Festival Juventus” where he was nominated “Lauréat Juventus” in 2008. Since 2010 Nathan regularly performs in duo recitals together with his wife Polina Leschenko. Past highlights have included Bartók's viola concerto and Paganini’s Gran Sonata per la viola with the “Limburgs Symphonie Orkest”, Berlioz's Harold en Italie with the Brussels Philharmonic under the baton of Maestro Michel Tabachnik at the Palais des Beaux-Arts in Brussels, début recitals at the Théâtre de la Ville in Paris, the Palais des Beaux Arts and numerous chamber music concerts at the Concertgebouw in Amsterdam. His début recording for the Fuga Libera label with the complete works for viola, by the Belgian composer Joseph Jongen, has been released to great critical acclaim. Nathan’s recent recordings include the Dvorak piano quartet op.87 released on EMI Classics as part of the “Martha Argerich and Friends: Live from the Lugano Festival 2012” series. His first recital CD together with Polina Leschenko will be released in September 2015 for the Avanti classic label. Alongside his concert appearances Nathan teaches at the Royal Conservatory of Music inGhent,Belgium. Nathan Braude plays a viola by Pietro Giovanni Mantegazza (Milano, 1772). Andre Emelianoff is known worldwide as a cello soloist, chamber artist, and teacher whose innovative recital programs interweave new works, neglected older works and the classics of cello repertoire. He has toured as soloist and chamber artist throughout Japan, Russia, Austria and England as well as North America and has given recitals in central Asia and the Mediterranean as an American Ambassador for the Arts. Mr. Emelianoff has been principal cellist of the New York Chamber Symphony, the New Jersey Symphony Orchestra, the Musica Sacra and a member of the Cleveland Orchestra. As a member of the Da Capo Chamber Players, winner of the Naumburg Award and in residence at Bard College, he has participated in over 60 premiers and recorded Schönberg’s Pierrot Lunatre. A winner of a 1985 NEA Solo Recitalists award, Mr. Emelianoff has recorded for RCA, CRI, Opus One, New World Records, Nonesuch, GM Recordings, Bridge Records and Prop Arte. He has been guest artist with the Chamber Music Society of Lincoln Center, Houston's Da Camera, Mozarteum Salzburg and the Round Top Festival in Texas. He is on the cello and chamber music faculty of the The Juilliard School of Music and its Pre- College Division. Polina Leschenko was born in St Petersburg into a family of musicians and began playing the piano under her father’s guidance at the age of six. Two years later she performed with the Leningrad Symphony Orchestra in St.Petersburg. At the age of 12 Polina made her UK debut at the Barbican Hall in London playing Beethoven’s “Emperor” concerto. Since then Leschenko has worked with prominent orchestras such as the Salzburg Camerata, Hallé Orchestra, London Mozart Players, Scottish Chamber Orchestra, Bournemouth Symphony, Bern Symphony, Russian National Orchestra, I Pomeriggi Musicali in Milan, Orquesta de Euskadi and the Australian Chamber Orchestra. Polina has given critically acclaimed solo recitals and chamber music concerts at such renowned venues as the Konzerthaus in Vienna, Mozarteum in Salzburg, Concertgebouw in Amsterdam, Carnegie Hall and Lincoln Center in New York, Cité de la musique in Paris and the Opera House in Sydney. An accomplished and admired chamber musician, Polina Leschenko also performs frequently at many festivals, including the Salzburg Festival, Progetto Martha Argerich in Lugano, Verbier, Risor, Stavanger, la Roque d'Anthéron Aldeburgh, Oxford, Cheltenham, Stift, Istanbul, and Musiktage Mondsee. Regular collaborations with artists include Martha Argerich, Ivry Gitlis ,Patricia Kopatchinskaja, Ilya Gringolts, Julian Rachlin, Heinrich Schiff, Mischa Maisky, Torleif Thedéen and the Auryn Quartet. In 2003 Polina Leschenko recorded a début CD for EMI Classics in the series ‘Martha Argerich presents...’ with works by Liszt, Chopin, Kreisler/Rachmaninov, Brahms and Bach/Feinberg. She has also recorded a well--‐received disc of Prokofiev chamber music with Martha Argerich, Christian Poltéra and Roby Lakatos, for Avanticlassic, with whom she has a recording contract. Her recital disc – featuring an all--‐Liszt program including the B minor Sonata – was released in May 2007 to great critical acclaim, receiving a “Choc” du Monde de la Musique. Polina’s most recent CD’s include a recital CD entitled “Forgotten Melodies” (Avanticalssic), Mendelssohn double concerto with the Australian Chamber Orchestra and Richard Tognetti (BIS ) and a recording of the Dvorak piano quartet op.87 on EMI Classics as part of the “Martha Argerich and Friends: Live from the Lugano Festival 2012” series. Marina Primachenko was born in St. Petersburg to a family of musicians. She began her musical studies at the age of 3. Her studies took place at the St. Petersburg Special Music School and the State Conservatory of Music in St. Petersburg, and then continued under the great tradition of Heinrich Neuhaus in Moscow under B. Petrushansky and L. Timofeyeva. At age 14, she appeared with the St. Petersburg Philharmonic Orchestra performing Rachmaninoff Concerto No. 1. In 1991 she was appointed piano professor at the Conservatory of South Bohemia in the CzechRepublic. Two years later she settled in France where she won the grand prize of the international competition P. Lantier of Paris. Marina Primachenko has appeared as a soloist and chamber musician in Russia,France,England,Switzerland, the Czech Republic,Hungary and Italy. In addition to her extensive repertoire, she has brought many less known composers works to the public. Ms. Primachenko’s performances have been broadcast in her native city of St. Petersberg, the Czek Radio and on RCF. Marina Primachenko combines her performance career with her pedagogical work, regularly giving masterclasses, and participating in juries on international competitions such as the Chopin Competition in Marienbad and the E. Tjarry Competition at Cypres. She is professor at the famous Schola Cantorun in Paris. Pianist Gerald Robbins has distinguished himself internationally as a soloist having performed throughout the world in virtually every major music center including New York, London, Paris, Amsterdam, Bonn, Munich, Athens, Frankfurt, Belgrade, Moscow, St. Petersburg, Tel-Aviv, Jerusalem, and Tokyo. He has appeared with many major orchestras including the London Philharmonic, Royal Philharmonic, BBC Symphony and its affiliates, London Mozart Players, Los Angeles Philharmonic, Los Angeles Chamber Orchestra, the City of Birmingham Symphony Orchestra, the Moscow Philharmonic, and the New York Virtuosi Chamber Orchestra under such conductors as Zubin Mehta, Sir Neville Marriner, Edouard van Remoortel, Harry Blech, Okko Kamu, Jorge Mester, Lawrence Foster, Kenneth Klein, and Louis Frémaux. His other commercial CD recordings include a highly praised solo performance of Dvorák’s “Poetic Tone Pictures,” and Goetz’s Complete Chamber Music for Piano and Strings, all for the Genesis label. Mr. Robbins recorded the Leonard Bernstein and John Corigliano Sonatas for Violin and Piano with violinist Glenn Dicterow for Cala Records, and the Mendelssohn complete works for ‘cello and piano with ‘cellist James Kreger for the Koch Discover International label. His newest CD release for 4-Tay records includes a collaboration with conductor Kenneth Klein and the Moscow Philharmonic Orchestra of the Schumann Piano Concerto, and a re-release on CD for Genesis of piano works by Sjögren and Kjerulf, as well as a newly released CD of the Strauss and Turina Piano Quartets performed by the Lyric Piano Quartet on the Black Box label. In addition to his solo activities, Robbins has distinguished himself as a chamber musician in collaboration with many noted musicians such as Nathan Milstein, Pinchas Zukerman, Kyung-Wha Chung, Bronislav Gimpel, Zara Nelsova, Joseph Schuster, Ruggiero Ricci, and Glenn Dicterow. A co-founder with Glenn Dicterow of the Lyric Piano Quartet, Mr. Robbins records and tours with this ensemble. He has also appeared as a frequent guest artist with solo members of the New York Philharmonic Orchestra as part of its subscription concert series at Lincoln Center’s Avery Fisher Hall, as well as performing with them at Weill Recital Hall at Carnegie Hall, and Merkin Hall in New York City. Mr. Robbins is also an accomplished conductor. He co-founded with Kenneth Klein the Westside Symphony Orchestra of Los Angeles, presently called the Beverly Hills Symphony, and is a co-founder of the London Concertante, an ensemble that specializes in 18th and early 19th-century concerto repertoire. Mr. Robbins has received many important prizes throughout his career, including a major prize at the Van Cliburn International Piano Competition and a diploma from the Tchaikovsky International Competition. He received his Bachelor’s and Master’s degrees from the University of Southern California where he assisted in the string master classes of Jascha Heifetz, William Primrose, and Gregor Piatigorsky. A native of California, Mr. Robbins lived in London for several years and is now residing in New York City, where he is an Artist-in-Residence with the Lyric Piano Quartet at the Aaron Copland School of Music at Queens College, CUNY. He has developed a highly successful chamber music concert series at Queens College which continues to serve the community. He is also affiliated with the Hoff-Barthelson School of Music in Westchester, and is a member of the chamber music faculty of the Manhattan School of Music in New York City. Italian choral conductor and pianist, Roberto REGA was recently appointed as conductor at the Ruse State Opera in Bulgaria in 2014. There he has conducted instrumental, vocal and opera productions, including Pergolesi Stabat Mater, Gluck’s Orfeo ed Eurridice and Verdi’s Rigoletto and Aida among others. In addition he is the director of the Chœur Laudate de Lausanne, the Chœur des Pays du Mont-Blanc, and the vocal ensemble Si Fa Soul Singers in Turino. Roberto REGA has directed the Arte Musica women’s choir and Gospel Spirit of Geneva, the Terni orchestra, the Turino Conservatory orchestra and choir, the orchestra and Chœur Symphonique du Mont Blanc, the Jardin Musical de Grenoble, and the « Jeunes Virtuoses de New York ». Mr. Rega obtained his diploma in piano performance from the Conservatory of « L. D’Annunzio » in Italy. From 1991 to 1996, Rega studied under Victor Merzhanov, professor of piano at the Tchaikovksy Conservatory in Moscow, Russia. In addition he has pursued studies in composition. From the age of 12, he won numerous competitions and performed as a soloist and chamber musician in Italy, Poland, Russia, France, Egypt, Switzerland and Holland. In 1997 he was engaged as a pianist at the Grand Théâtre de Genève, and then at the Opéra National de Paris. He was awarded the audience prize by the Société des Arts de Genève in the «Jeudis du Piano» and he performed the «2&3 Part Bach Inventions» with the Ballet du Grand Théâtre de Genève on tour in the opera houses of Geneva, Caire, Alexandrie and Montpellier. in composition and choral conducting under Paolo Tonini Bossi and Dario Tabbia. His opera conducting studies were under Maestro Niels Muus. Soprano Fosca Aquaro, was born in Taranto, Italy. Her musical studies began at an early age with studies in piano, voice and acting at the Lycèe musical G. Paisiello (Taranto). At age 8 she participated in the “Zecchino d’oro” competition. In 1984 she received her diploma and continued to pursue her studies in Milano, Italy and in New York. She later specialezed in baroque performance practice under Véronique Carrot at the Conservatoire de Genève, as well as under Gabriel Garrido, Renata Scotto and Placido Domingo. She holds a diploma in pedagogy from the Conservatoire HEM de Genève. Fosca has participated in numerous solo and chamber music recitals and concerts. Her repertoire is large and spans all the eras, from the baroque to the modern. As a soprano, she has sung major roles in numerous operas including Zerlina (Don Giovanni), Lucia (Lucia di Lammermoor), Violetta (Traviata), Gilda (Rigoletto), Rosina (Il Barbiere di Siviglia), Mimi (La Bohème), Euridice (Orfeo ed Euridice). She also sings in the chorus at the Choeur du Grand Théâtre de Genève. Fosca’s performances have been aired over la RAI, Rai3, Canale 5 and Radio Montecarlo. In Geneva, Fosca has taught voice at the Académie de Musique de Genève, at the Esope School, and at the Kodaly school. She has conducted several choirs made up of young singers, and has prepared children for staged operas, including the Magic Flute. In addition, she has taught music history, harmony and piano at the Institut Mario Costa in Taranto, as well as voice in Bresso (Milan) and at the Scuola Civica di Musica.